Oh, so girly! I wasn’t planning to have this one turn out so pink and purple, but sometimes you can’t help yourself. And with a title like “I’ll Live for Him,” It’s hard to expect camo, I suppose. The bird is actually made from some of my paper fabric, nice for cutting, nice for stamping, nice for sewing. I don’t have to worry about it drooping. Here’s a little secret: there’s a painting hiding under the quilt. Nobody will ever see it, since the quilt is sewn onto the panel backing, but it’s there. Anybody buying this one will get a two-fer without knowing it! 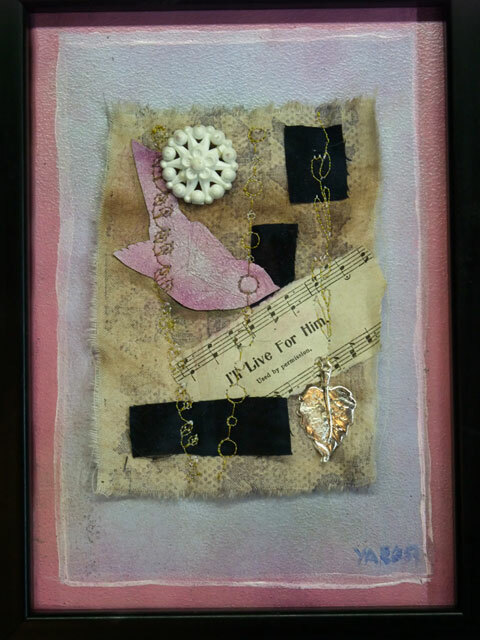 This entry was posted in Art, collage, Quilting, sewing and tagged art, collage, Crafts, mixed media, Needlework, postaday2011, quilt, Quilting, sewing, Studio droppings, Textile, Textiles and Nonwovens. Bookmark the permalink.